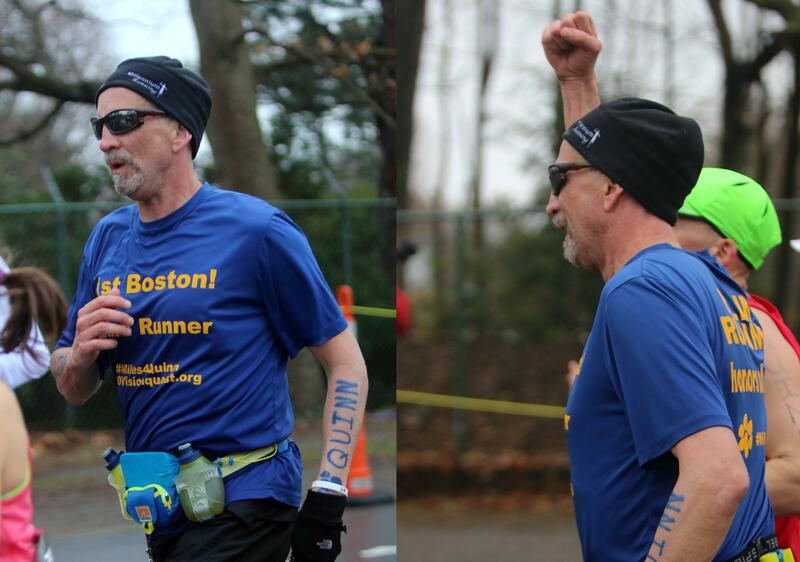 Randy Pierce of Nashua is cheered on by the crowd as he runs through Newton at mile 18 during the 2015 Boston Marathon. Update: Despite Monday's wet, dreary weather Randy Pierce hit his goal of breaking four hours, crossing the finish in 3 hours and 50 minutes. When 30,000 runners line up this morning in Boston, many will be running for some cause or some loved one, and that’s the case for Nashua runner Randy Pierce, but he's doing it with an extra challenge -- he's blind. And with the record-breaking snowfall, subzero temperatures and icy conditions, training this winter without being able to see was no easy task. Left, Greg Hallerman, Peter Houde, Christine Houde and Randy Pierce warm up before their 21 mile long run in Hollis. “But I can’t just say, I don’t care that it is minus 5 I’m going to go out and run, but I have to convince someone else to be as crazy as me, and not only do they have to be as crazy as me but they have to be somewhere in my training range,” said Pierce, 48, before his last 21 mile long run. And for much of the season Pierce logged a lot of his miles with longtime runner Greg Hallerman of Hollis, who says it was difficult for Pierce to find runners who could keep up with him. “There are no obstacles that are too big for him, don’t tell him, he can’t do something because he will,” Hallerman said during the run. This drive was something his wife Tracy Pierce learned very quickly. “He is a very determined individual, he has willpower of steel, it’s sort of crazy, he can just set his mind to something and do it,” she said. At 22, Pierce was diagnosed with a neurological disorder that left him blind, even putting him in a wheelchair for some time. His guide dog, Quinn, got him back on his feet, Pierce said. 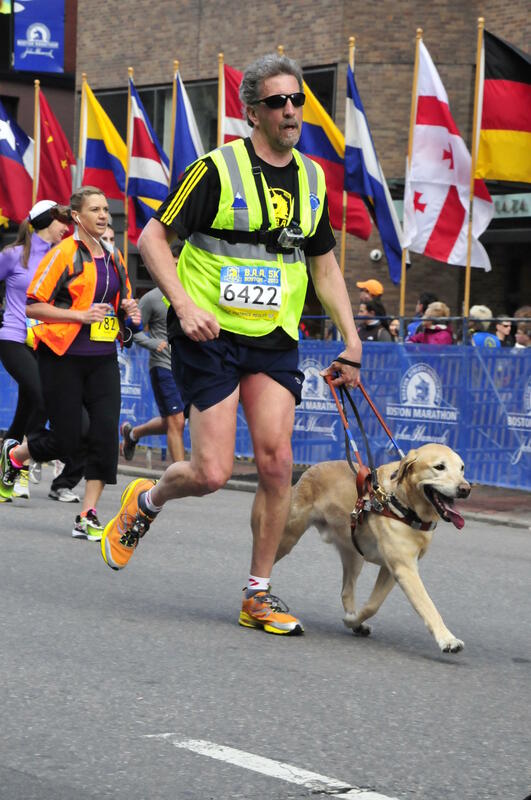 Randy Pierce and his guide dog Quinn cross the finish line of the Boston Athletic Association 5k a day before the 2013 Boston Marathon bombings. “They’re with you 24-7 when you have a dog guide, everywhere you go, you are putting your life in their hands and all of that is based on building this bond of love and trust that is so strong, but in the amount of time that he was with me I spent more time with him than any other being ever, including my parents,” Pierce said about his yellow lab. But in January of last year Quinn died after battling bone cancer. And this year, Pierce is running Boston for the first time for him because Quinn, he said, got him back into running, something Randy never thought he would be able to do again. 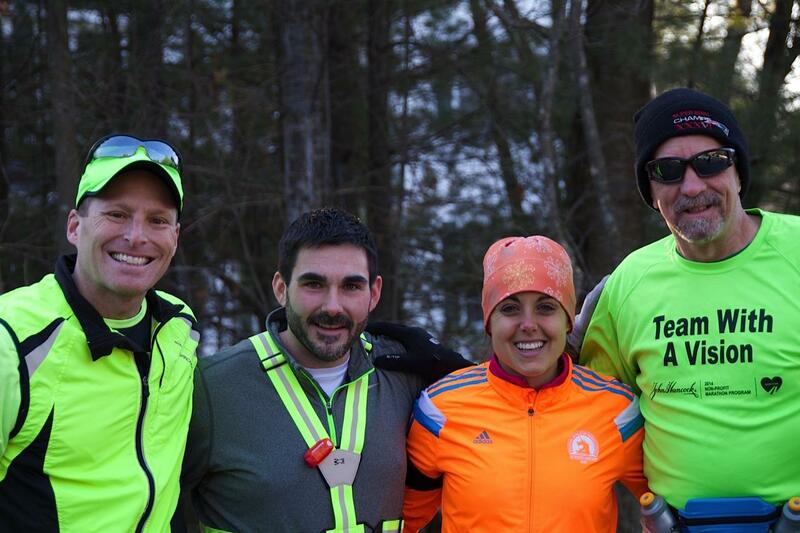 Pierce and Quinn ran more than 30 road races together and hiked all 48 mountains in New Hampshire, and to Randy running the superbowl of all road races is the best way to honor Quinn. “I want to celebrate him because loss is hard and I love my boy and I still tear up every time I think about him, but I will always hope to celebrate how lucky I was and how lucky I think he was that we had so many great experiences together,” he says tearing up. 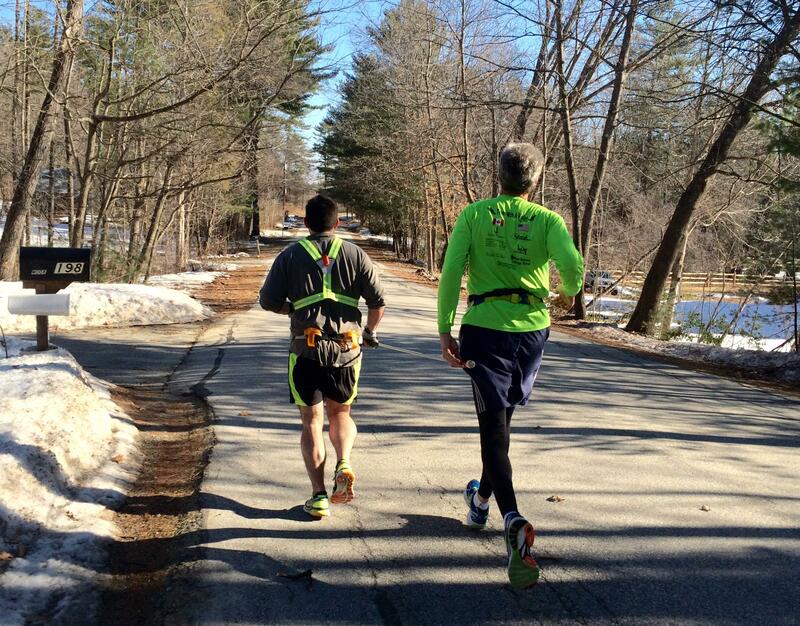 Randy Pierce of Nashua runs his last long run of 21 miles with his guide Peter Houde who will guide Pierce along with his wife, Christine Houde, during the marathon. Being a blind runner, racing in a field of over 30,000 runners isn’t easy, especially Pierce says in places like the famous Wellesley Scream Tunnel where it will be too loud for him to hear his guide. But Pierce says he has all the motivation he needs. “When it gets hard, what do I do, I think of my boy. I think about him guiding me up all those mountains or running those road races or just curled in my lap." The Boston Marathon, however, is not the end for Pierce – his next adventure is to climb Mount Kilimanjaro this fall with his wife.